Evoke the beauty of light streaming through leaves with this tealight holder. Evoke the meditative beauty of light streaming through leaves with this intricately etched tealight holder. 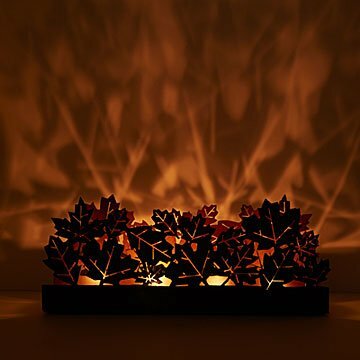 Four tealights (not included) concealed in the space between two organic arrays of leaves capture the magic of light breaking through forest foliage and cast sylvan shadows on your wall. Finished with a warm ombre patina, they make inviting year-round decor. Made in India. Pair the Maple Leaf trough with our Set of Tealights. Wipe clean with a damp cloth, air dry. Holds 4 tealights (not included). Pretty but could be improved. I was impressed with the design, but felt it would have looked more impressive with a bit more gold on the leaves. I added larger glass tealights having to plug the existing holes. The larger candles really brought the whole piece together.